From the Department of Neuromuscular Research (T.T., N. Minami, I.A., S.N., I. Nonaka, S.M., I. Nishino), National Institute of Neuroscience, National Center of Neurology and Psychiatry, Tokyo; Department of Pediatrics (S.H., H.S., G.I., O.A. ), Dokkyo Medical University School of Medicine, Tochigi; Department of Mental Retardation and Birth Defect Research (J.O., Y.G. ), Division of Genetic Diagnosis (N. Minami), Department of Laboratory Medicine, National Center Hospital, NCNP, Tokyo; Department of Child Neurology (N.S., I.A., M.S. ), National Center Hospital, National Center of Neurology and Psychiatry, Tokyo; Department of Pediatrics (N. Murakami), Dokkyo Medical University Koshigaya Hospital, Saitama; and Department of Genome Medicine Development (N. Minami, S.M., I. Nishino), Medical Genome Center, National Center of Neurology and Psychiatry, Tokyo, Japan. Recessive mutations in TK2 cause a severe mitochondrial DNA depletion syndrome (MDS),1 characterized by severe myopathy from early infancy. Recent reports have suggested a wider clinical spectrum including encephalomyopathic form.1,2 We report a patient with infantile-onset fatal encephalomyopathy presenting with extreme muscle fiber immaturity. A female Japanese infant was born to nonconsanguineous healthy parents at 38 gestational weeks. Soon after birth, she began to have seizures and respiratory distress, requiring antiepileptic agents and mechanical ventilation. Physical examination showed facial weakness with narrow high-arched palate, generalized hypotonia, and muscle weakness. Creatine kinase level was 7,709 IU/L at 2 days of age. Venous lactate concentrations were normal. Muscle CT showed generalized muscle atrophy and fat tissue replacement. Cardiac echogram revealed hypertrophic cardiomyopathy. MRI of the brain displayed lissencephaly, thin corpus callosum and ventricular dilatation, and cerebellar hypoplasia. Serial brain CT scans at 3 days (figure 1A) and 1 month (figure 1B) of age revealed rapid brain atrophy with markedly dilated ventricles. She had progressive generalized muscle weakness and atrophy. She died at 10 months of age due to congestive heart failure. Permission for autopsy was not obtained. (A, B) Brain CT at age 3 days (A) and 1 month (B) shows rapidly progressive brain atrophy and ventricular dilatation. (C) In muscle biopsy stained with hematoxylin and eosin stain, most of the fibers are extremely small and embedded in fibrous tissue. (D) On immunohistochemistry for MHCd, developmental MHC positive fibers stained green are markedly increased in the patient (D.a) but not in controls (D.b). (E) Two representative abnormal fibers on electron microscopy. The left fiber is filled with mitochondria (encircled) and lipid droplets (L). Some mitochondria contain paracrystalline inclusions (inset). The right fiber contains poorly organized myofibrils (encircled). Satellite cell (S). (F, G) Whole-exome sequencing reveals c.574A>G and c.125-1G>C mutations. cDNA of whole coding region from muscle shows that only the transcript with missense mutation was expressed. In this transcript, exon 1–2 boundary was normal, suggesting that the other allele possibly with splice site mutation was decayed and not expressed. Biopsy of the biceps brachii at the age of 4 months revealed that most of the fibers were extremely small, measuring 4–6 μm in diameter. There was marked endomysial fibrosis without necrotic or regenerating fibers (figure 1C). Cytochrome c oxidase activity was diffusely defective (figure e-1 at Neurology.org/ng). Peripheral nerve bundles in the muscle were well myelinated. There was no fiber-type grouping and group atrophy suggesting peripheral nerve involvement. On electron microscopy, almost all fibers were small, measuring less than 5 μm in diameter. None of the fibers appeared to be normal, showing 2 kinds of major abnormalities: fibers filled with markedly proliferated mitochondria with lipid droplets in about half and markedly disorganized myofibrils in the remainder. Large satellite cells with prominent nuclei having dense heterochromatin were found in 14% of the 100 fibers examined (figure 1F). Immunohistochemistry for developmental (MHCd:Leica) and neonatal myosin heavy chain (MHCn:Leica) was expressed in 24% and 50% of the muscle fibers, respectively (figures 1D, e-2, and e-3), while in age-matched controls, they made up less than 1% by both stains (figures 1E, e-2, and e-3), reflecting a marked delay in muscle differentiation. Whole-exome sequencing revealed 2 novel mutations of TK2 genes: c.125-1G>C substitution in intron 1 and c.574A>G, p.R192G (GenBank Accession Number: NM_004614.4) (figure 1, G and H, e-Methods). There were no relevant variants in mitochondrial genes that can explain the disease. In support of the claim that this missense mutation causes the disease, the mutation at the same amino acid position R192K has been reported to cause the disease.3 This amino acid is well preserved among species (figure e-4). Sequencing of cDNA from the patient's muscle tissue demonstrated that transcript from the allele carrying the missense variant was only expressed (figure 1G). The intronic mutation might cause aberrant splicing and nonsense-mediated mRNA decay. We concluded that these mutations are compound heterozygous and pathogenic, although we could not obtain the parents' DNA. Mitochondrial respiratory chain enzyme activities were markedly decreased in skeletal muscle (figure e-5). Quantitative PCR revealed that mitochondrial DNA (mtDNA) in skeletal muscle was markedly reduced to 8% (figure e-6, e-Methods). Although TK2 mutations are known to cause myopathy, some patients, including ours, had CNS abnormalities.1,2,4 A recent article1 reported 2 brothers with rapidly progressive brain atrophy similar to our patient, whose muscles showed fat tissue proliferation. It is not known why the phenotypic variation occurs in TK2 mutations while mtDNA depletion levels are similar. Of interest, R192K mutation in the same amino acid was reported previously in an MDS patient with pure myopathic form, although the mtDNA was decreased to 8% as in our patient (8%).3 Thus, we suspect that there may be a phenotype-genotype correlation in this disease. The most striking finding in our patient is the delayed muscle maturation in TK2 mutation. Muscle immaturity was confirmed by numerous positive MHCd and MHCn on immunohistochemistry, and poorly organized myofibrils and increased numbers of satellite cells (14%). In normal neonatal muscle, satellite cells make up less than 5%. Increased numbers of satellite cells were seen in immature fibers in congenital myopathies and actively regenerating fibers after necrosis. Half of the muscle fibers were filled with extensively proliferated abnormal mitochondria. Several reports suggest that mitochondrial biogenesis and activity are significantly increased during myotube differentiation and maturation.4 We suggest that mitochondrial respiratory chain activities and mtDNA copy numbers are important factors for muscle maturation. This is the rare case of TK2-related encephalomyopathic MDS5 with delayed muscle maturation, thus broadening the spectrum of the disease. 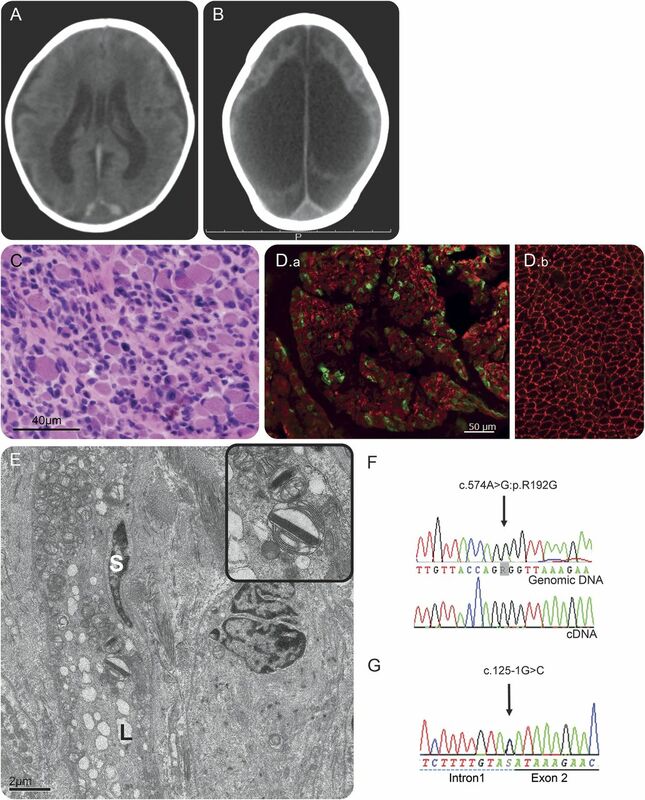 It is worthy to note that MDS with TK2 mutation should be suspected when a patient shows rapidly progressive cerebral atrophy and immature skeletal muscle. Author contributions: Thanes Termglinchan: study concept, analysis and interpretation of the data and drafting/revising the manuscript. Seito Hisamatsu, Hiroshi Suzumura, George Imataka, Osamu Arisaka, and Nobuyuki Murakami: collection of clinical data and drafting/revising the manuscript. Junko Ohmori, Noriko Sumitomo, Ishiyama Akihiko, Masayuki Sasaki, Satoru Noguchi, Ikuya Nonaka, Satomi Mitsuhashi, and Ichizo Nishino: analysis and interpretation of the data and drafting/revising the manuscript. Study funding: This study was supported partly by a grant for Research on Rare and Intractable Diseases (H26-Itaku (Nan)-Ippan-081), from Japan Agency for Medical Research and Development (AMED); partly by Intramural Research Grants 26-8, 26-7 for Neurological and Psychiatric Disorders from the National Center of Neurology and Psychiatry. Disclosure: Dr. Termglinchan has received research support from the Japan Agency for Medical Research and Development (AMED), the National Center of Neurology and Psychiatry, the Epilepsy Society of Thailand, and the Neurological Society of Thailand. Dr. Hisamatsu, Dr. Ohmori, Dr. Suzumura, Dr. Sumitomo, Dr. Imataka, Dr. Arisaka, and Dr. Murakami report no disclosures. Dr. Minami has completed comment writing in a genetic testing report for Orphan Net Japan. Dr. Ishiyama and Dr. Sasaki report no disclosures. Dr. Goto has received research support from the Japan Agency for Medical Research and Development (AMED) and the National Center of Neurology and Psychiatry (NCNP). Dr. Noguchi holds patent WO 2010/131712A1 and has received research support from Novartis Pharmaceuticals Japan, an Intramural Research Grant for Neurological and Psychiatric Disorders of NCNP, a grant from the Ministry of Health, Labour, and Welfare, and Health and Labour Sciences Research Grants. Dr. Nonaka and Dr. Mitsuhashi report no disclosures. Dr. Nishino has served on the scientific advisory boards of Genzyme, Ultragenyx, and Novartis; has received speaker honoraria from Genzyme; has served on the editorial boards of Neuromuscular Disorders, Neurology and Clinical Neuroscience, Therapeutic Advances in Neurological Disorders, the Journal of the Neurological Sciences, Skeletal Muscle, and the Journal of Neuromuscular Diseases; holds a patent for efficacious agents to pathologic condition due to GNE protein dysfunction; and has received research support from Intramural Research Grant for Neurological and Psychiatric Disorders of NCNP, JSPS KAKENHI Grant, the Japan Agency for Medical Research and Development (AMED), and H26-Itaku (Nan)-Ippan-081. Go to Neurology.org/ng for full disclosure forms. The Article Processing Charge was paid by the authors.
. Clinical application of whole exome sequencing reveals a novel compound heterozygous TK2-mutation in two brothers with rapidly progressive combined muscle-brain atrophy, axonal neuropathy, and status epilepticus. Mitochondrion 2015;20:1–6. Two novel mutations in thymidine kinase-2 cause early onset fatal encephalomyopathy and severe mtDNA depletion. Neuromuscul Disord 2010;20:198–203.
. Molecular insight into mitochondrial DNA depletion syndrome in two patients with novel mutations in the deoxyguanosine kinase and thymidine kinase 2 genes. Mol Genet Metab 2005;84:75–82. New mutations in TK2 gene associated with mitochondrial DNA depletion. Pediatr Neurol 2006;34:177–185. Collated mutations in mitochondrial DNA (mtDNA) depletion syndrome (excluding the mitochondrial gamma polymerase, POLG1). Biochim Biophys Acta 2009;1792:1109–1112.